UPDATED: Sun., May 13, 2018, 6:25 p.m.
DETROIT – Even if Seattle had won, this would have been a tough day for the Mariners. 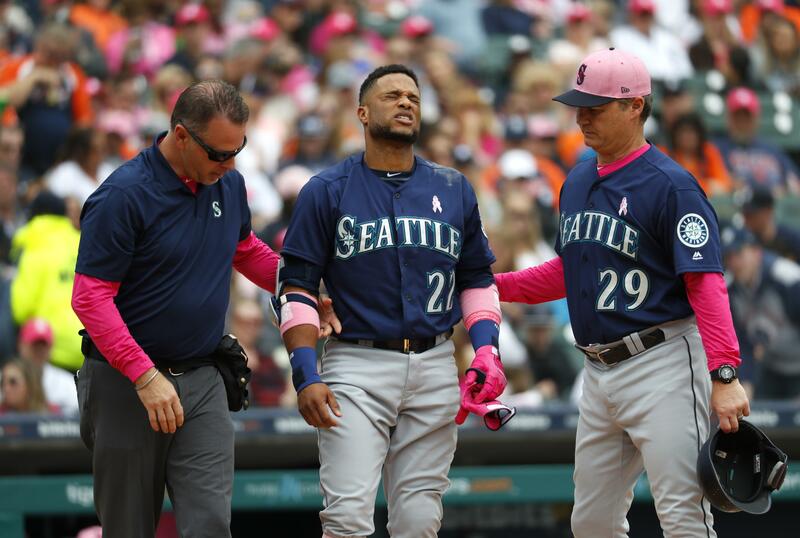 Robinson Cano left the game in the third inning with a fracture in his right hand, and the Mariners went on to lose 5-4 to the Detroit Tigers on Sunday when Jose Iglesias hit an RBI single in the bottom of the ninth. The defeat marked the first time all season that Seattle lost a series on the road, but the bigger issue is the health of the Mariners’ standout second baseman. Cano left after being hit by a pitch . He hasn’t missed a game this season and has played in at least 150 in 11 straight years. The Mariners (22-17) have looked like contenders for their first postseason spot since 2001, but losing Cano for an extended period would obviously hurt. The team said he has a fractured fifth metacarpal. Kyle Seager hit a solo homer in the second for Seattle, but Niko Goodrum homered and had three hits for the Tigers. Goodrum’s single in the ninth allowed JaCoby Jones to advance to third with nobody out, and Iglesias followed with a single up the middle off Juan Nicasio (1-2). James Paxton allowed three runs and six hits in six innings for the Mariners in his first start since throwing a no-hitter Tuesday at Toronto. The Tigers were nowhere near full strength, with slugger Miguel Cabrera on the disabled list and regular starters Nicholas Castellanos and Jeimer Candelario also out of the lineup, but the bottom of their order came through. Goodrum, Iglesias and Dixon Machado – Detroit’s 7-8-9 hitters – went 6 for 10. Shane Greene (2-2) pitched a scoreless ninth for the win. Detroit took two of three in the series, and the three games were played in just under 24 hours. The teams split a doubleheader Saturday that started at 4:10 p.m. Published: May 13, 2018, 11:20 a.m. Updated: May 13, 2018, 6:25 p.m.